In the coming week Jamer Hunt, Associate Professor of Transdisciplinary Design; School of Design Strategies; Parsons The New School for Design will be visiting our school. This presentation will explore the phenomenon of scale and demonstrate the ways in which “scalar framing” can be utilized as an analytical and generative tool in designing for socio-technical systems. Scale is an overlooked quality of complex design problems; shifts in scale often result in surprising behaviors. I will present scalar framing as a method that enables designers to think through systems and organizations in order to locate leverage points for design intervention. Jamer Hunt collaboratively designs open and flexible programs that respond to emergent cultural conditions. 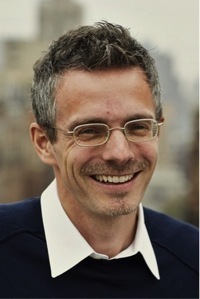 He is the Director of the experimental graduate program in Transdisciplinary Design at Parsons The New School for Design. His practice, Big + Tall Design, combines conceptual, collaborative, and communication design, and he is co-founder of DesignPhiladelphia, now the largest city-based design festival in the US.